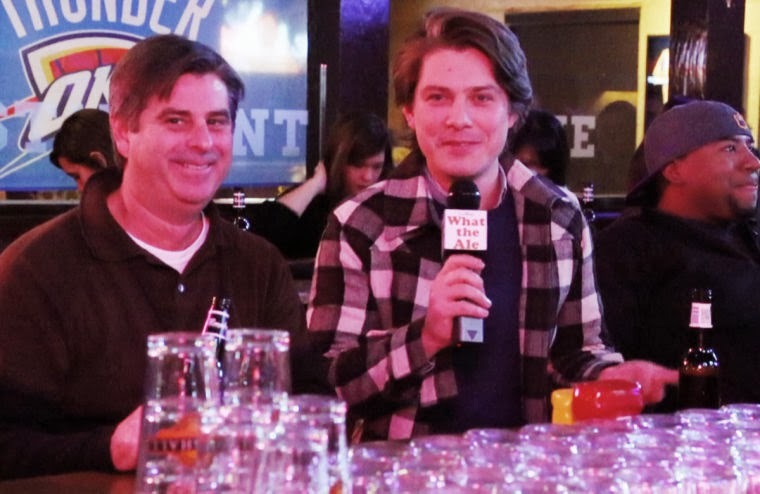 Fans of Hanson got a special treat as Taylor Hanson helped celebrate the beer of the month at Leon’s. In Tuesday at Leon’s, 3301 S. Peoria Ave. in Brookside a beer of the month was announced. This isn’t just any beer. It is from our hometown rock stars Hanson. Taylor Hanson was nice enough to sit down and talk about beer with me before the official visit to promote Mmmhops at the restaurant. Taylor and his brother Isaac collaborated with Mustang’s brewmaster Gary Shellman to produce Mmmhops. The beer is well-balanced American pale ale that is easy to drink with a nice malt and hop balance. I am not sure why there were so many ladies there, I am guessing they found out I was going to be there. OK, OK, more likely they heard that Taylor Hanson was going to show up. All of them were eager to tell me their Hanson stories. One had seen all of their concerts at Cain's Ballroom, another has been a fan since the second grade. A group of ladies had ordered Cosmos but promised me they were getting Mmmhops next. I watched and they did. Taylor has been around the world so he knows about beers and community. “Beer is one of those things like apple pie, it is one of the great bonding compounds that go with life all over the world, but in America that hey I am going to have a cold beer after a long day, is something that brings people together. It literally brings people from all walks together from your pastor to a biker to a 22-year-old college guy -- everybody can still raise a glass together.” Taylor said.